Bangalore... er! Bengaluru, as the city is now known, was once known the Pensioners' Paradise, for its calm, relaxed and peaceful environment. However, with the dawn of the IT era, the city lost its calmness, and became crowded and infamous for traffic snarls. 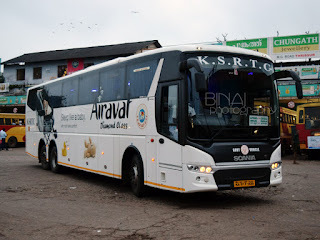 An average Bangalorean spends more time on the road than at home, goes the saying. For all its ills, I in love with this happening city. The unpredictable fever friendly climate, roads that resemble war zones during the day and desert during the nights are all factors that make me fall in love with this city. 1. 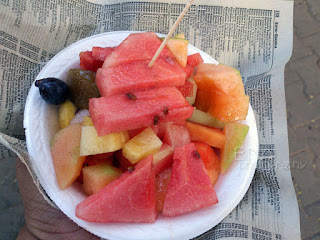 Countless fruit plate stalls on streets! Bangalore loves its fruit plates. These fruit plates are generally made up of the fruits of the season, and generally include Watermelon, Muskmelon, Papaya and Pineapple. Banana is used as a filler to make up the volume. Sapota (Chikku) is often added as well. A generous amount of salt and pepper is sprinkled on the top layer. Some sellers add a solution which they call Honey as well. The average cost of the serving is Rs. 15~20. The serving is generally filling - but comes with a lot of health risks related to cleanliness. I generally prefer sticking to vendors who have been around for a long time. 2. Mirchi Bhajji at Roti Mandir, Kempegowda BS. Raw, crisp, capsicum fritters served with a generous quantity of coconut-mint chutney. This would be an apt one line description of the Mirchi Bhajji at Roti Mandir located near Platform 4 in Kempegowda Bus Station aka Majestic Bus Station (the city service side). Served at Rs. 15 a plate, they give out 4 pieces of Bhajji. I would suggest opting a mixed plate - which would give you a piece or two of every fried fritter they made that evening. Another not-so-healthy snack. Puffed rice garnished with onion, carrot, coriander leaves and some fried namkeen, topped with sev. Generally a spicy chutney and a dash of lemon is added for the flavour. 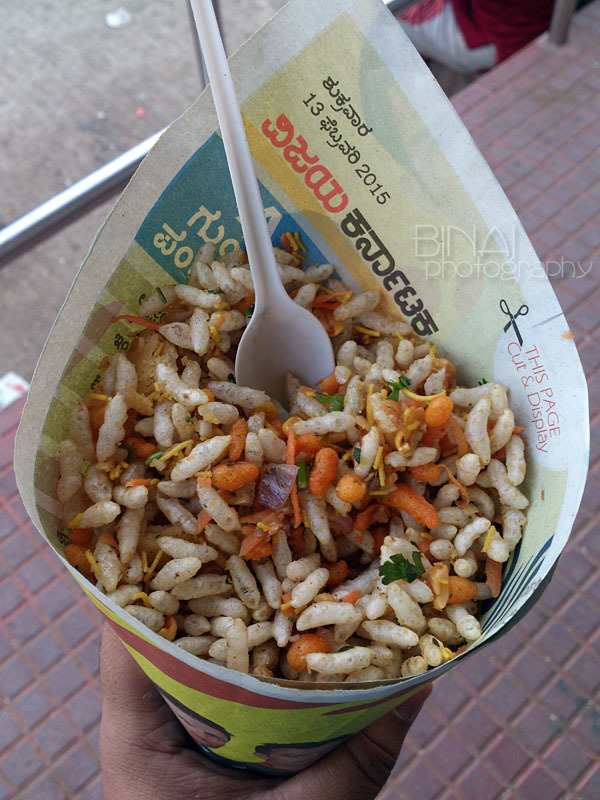 The item is generally prepared fresh and cannot be retained for long since the puffed rice gets soaked if its kept for long - it tastes best when its crisp. A serving generally costs Rs. 20. 4. Idli-Vada soaked in Sambar! Idli-Vada is the most eaten breakfast item in hotels across Bangalore, if I am right. 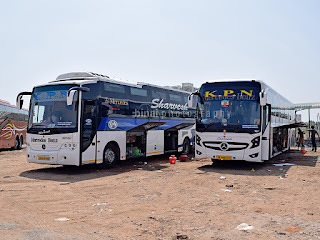 The cost varies according to the type of hotel - a roadside darshini will charge about Rs. 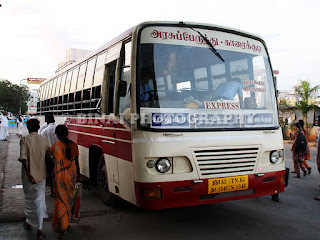 25~30, while a slightly upmarket darshini will charge about Rs, 40~50. 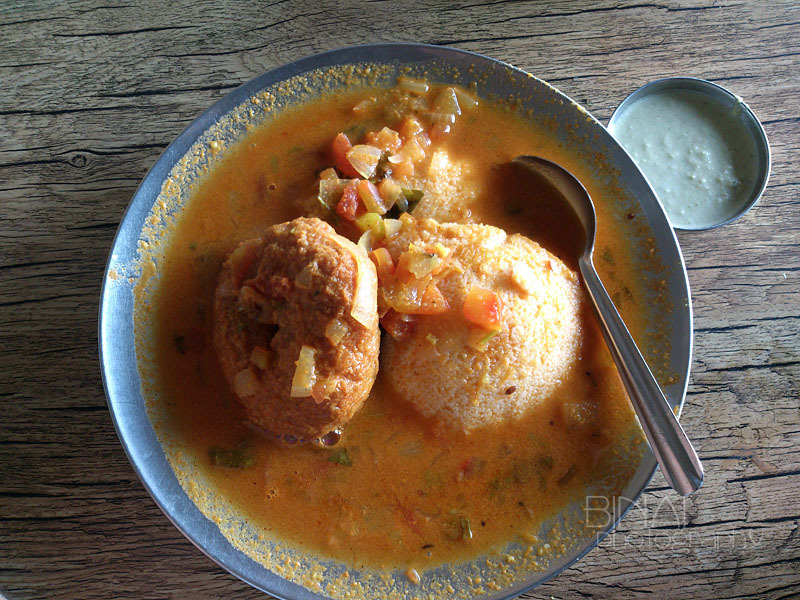 Idli is one of the most common breakfast dishes in South India. Idli is a steamed item made of Rice and Lentils. 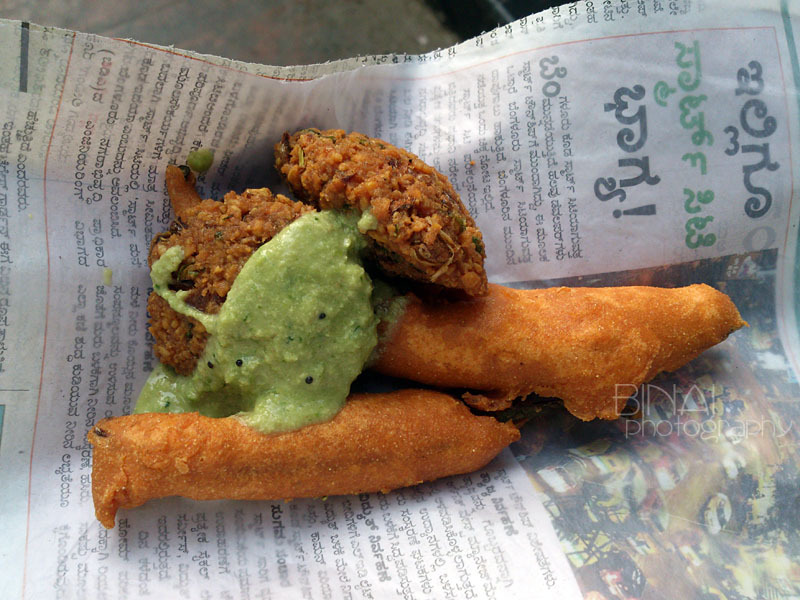 The accompaniment - Vada - is a fried snack made of lentils. The most common form of having this item in Karnataka is to dip it in hot Sambhar. Coconut chutney is a great accompaniment for this concoction. 5. The cold Badam Milk at Nandini outlets! No better drink to down all the sin you did at the food stalls on the roadside! 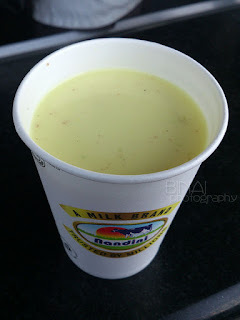 Badam milk is a very common drink in Karnataka. Badam milk can be drunk cold or hot. Both items are equally popular. I am a fan of the cold version though - which generally costs about Rs. 20 at roadside stalls. Nandini is the brand name used by Karnataka Milk Federation. Nandini stalls are present everywhere in the city. This cold drink is filling, cooling and a health alternative compared to the colourful bottle drinks. This is just a beginning. I plan to write more similar stuff in the coming days.. stay tuned.